Ryan Air flies to the capital Podgoricia (approx 1.5 hours by car) Dubrovnik airport is 40 miles from Perast (approx 1.5 hour drive) and served by BA, Norwegian and Easyjet. Tivat airport is 16 miles a 30 minute drive away. There is also an almost daily ferry service operating to and from Bari in Italy to Bar in Montenegro (approx 1.5 hours from Perast) The crossing time is approx. 9 hours and operates in the summer season. As you are leaving Dubrovnik airport turn left onto the highway and follow the road for 20 minutes until you arrive at the Croatia-Montenegro border. Having crossed the border you follow the same road by the water for approximately one hour all the way until you arrive at Perast. You will pass through the following towns and villages along the way (in this order) – Herceg Novi, Zelenika, Kumbor, Djenovici, Baosici, Bijela, Kostanjica, Donji Morinj, Lipci, Strp and Risan to reach Perast. 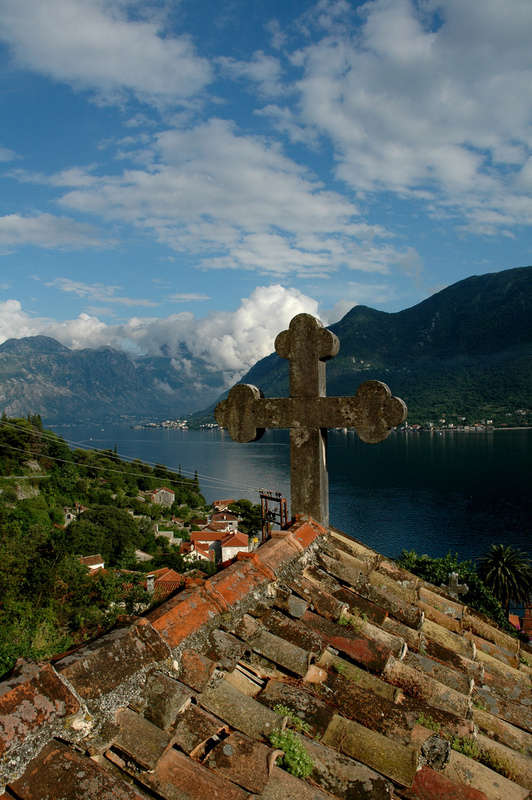 Once at Perast keep on the road that passes above the village (don’t go down to the waterfront) and stop by the small cemetry close to the edge of the village. Follow the steps down past the stone cemetry gate and you will find the ‘Three Bells Apartment’ located in the first building on the right. You can take either the route via tunnel Sozina or Cetinje. To drive through Sozina, when leaving the airport drive on and turn left on entering E 65 / E 80 road. You will remain on this road (and pass through the tunnel) until you reach the coast in the little village called Djurmani. There you need to turn right and drive on to Budva. On the other hand if you take the route via Cetinje, from the airport you need to turn right on entering the main road, drive to and through Podgorica (see google maps for details) and then pass by Cetinje. This road will also lead you to Budva. In either case you need to pass through Budva and after about 30 minutes drive arrive to a big round-about Budva-Kotor-Tivat-Radovici where you will need to take the right turning to Kotor. You will then pass through a smaller tunnel. Remain on the road and you will come to another very small round-about where you need to take the road ahead of you. You will then pass by Kotor Old Town. Remain on the same road and keep driving through villages Dobrota, Sv. Stasije (St Eustace), Ljuta and Orahovac to reach Perast. On leaving the airport turn right on the main road and drive ahead to arrive to a big round-about Budva-Radovici-Tivat-Kotor where you need to turn left to Kotor. Drive on, pass through the tunnel and remain on the road to reach another-round about – a very small one this time. Take the road ahead of you, pass by Kotor Old Town, drive on through villages of Dobrota, Sv. Stasije (St Eustace), Ljuta and Orahovac to reach Perast. The entrance point to Perast from Kotor side is very easy to spot from the main road – you will notice the parking lots on the side of the road (during summer season Perast is free of vehicles) as well as a white container-like cabin where the parking manager is. To arrive at the apartment take the road going up above the village and park by the small cemetery. There are buses approx every 30 minutes from Podgoricia or Tivat to Kotor and buses every hour from Kotor to Perast. Fabulous 1 bedroom apartment in the beautiful village of Perast, Montenegro. Available for rent throughout the year from £70 - £95 a night.